Does anyone else think the image of a skinny cow is a little strange? My kids thought the packaging was hilarious. What is up with that cow? I guess she is living the "skinny dream" that the rest of us will live if we eat Skinny Cow products. 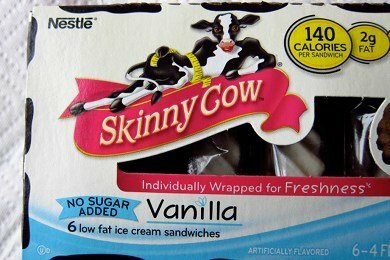 In case you didn't know, the Skinny Cow Brand makes low fat and sugar free ice cream. I was first introduced to Skinny Cow when I joined Weight Watchers in 2005 to lose the baby weight. These sandwiches solved a really big problem that I had with ice cream. My favorite ice cream was Ben & Jerrys and now I could satisfy my craving (and not eat 1/2 pint of Cherry Garcia) with a Skinny Cow ice cream sandwich. The dark side of Skinny Cow is that when you remove fat and sugar from ice cream you have to replace it with SOMETHING. 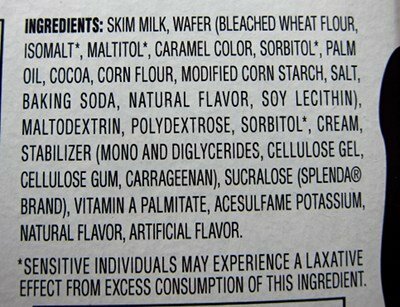 Don't you love that line about a "laxative effect"? Makes you wonder what other kinds of effects this sandwich will have. What you get of course is a chemical cocktail that AMAZINGLY mimics the flavor, texture, and sweetness of ice cream. And, while I usually would say AVOID such a product with its sorbitol and sucralose - if you have a problem with ice cream and need to lose some weight - these can be handy. I stopped eating them at one point because I got my ice cream habit under control. Somehow, eating less ice cream led to wanting less ice cream. Now I find that I can eat a small portion of delicious ice cream and forget the rest of the pint is in the freezer. In my travels, I have found two alternatives to Skinny Cow that taste better, have fewer calories, and much cleaner ingredient lists. Both So Delicious Coconut Minis and Haagen Dazs portioned sorbets and frozen yogurts are delicious and there is no sucralose or sorbital to be found. Read my posts on them below. Do you eat Skinny Cow ice cream sandwiches? Thank for highlighting that although a food may be very exciting and low in calorie it can be filled with chemicals. I say stick with whole organic foods. read your labels. I say if you are worried about all the baddies in ANY ice cream(vegan, or no) make your own. I made some in my high school chemistry class, so it's really not difficult at all. In the end, REAL food and ingrediants are far better for your body than all the man made stuff to cut out fat, calories, and sugar. All that stuff is essentially toxic to our bodies and we don't process and break it down properly. Hence the ever rising issues with cancer as growths are often caused by toxins we are putting in our body. So do I eat skinny cow? Absolutely not! I will take a full sugar full fat ice cream in moderation. Moderation and portion control is key. People need to stop substituting fake for real and just learn how to eat healthy and in moderation. I hear you! The last time I was at the grocery store, I went to pick up some Skinny Cow sandwiches as I ate them when I was losing weight. I took a quick glance at the ingredients list (not just the nutrition facts like I used to) and promptly put them back. Was disappointed to see a snack I used to like be so full of junk. I'm going to look for those coconut milk ones...look promising! I used to eat these some times & think well it's better than real ice cream, right? but turns out I'm gluten intolerant, so for me it was 10X worse than just real ice cream. my new motto, real food, real results. (they do taste pretty good) but like you said, they have to replace the real food (cream & sugar) w/something else & it's chemicals & by-products. if you read the ingredients, gross. Skinny cow ice creams are not sugar free, they are no sugar added. Now, saying that, I will say that the sandwiches are delicious. The mini cups are a nice treat when you want a sundae feel to your treat. And I never had a laxative effect take place after eating them. Talk about a timely article. I just bought these this WEEK! I only looked at the calories, not the ingredients. DUH! Thanks, I will try the coconut mini's next time. Love your articles!! Keep it up! I've been telling people for years that Skinny Cow is not 'all that'. Just yesterday I mentioned it to someone and pulled random scary things out of the ingredient list. I personally find it disgustingly sweet. Great post. I love Skinny Cow, but not the chemicals! I'd be interested to hear your thoughts on Arctic Zero ice cream "substitute", I absolutely love them but don't know if I should be concerned about the ingredients list! There's not a single Real Food ingredient in the whole list. @Kailey - I cannot get my hands on Arctic Zero without buying a CASE. I am working on it. What is Maltodextrin? Is it bad for you? I've seen it in a lot of "healthy" food items. The So Delicious coconut ice creams are really delicious! It's a perfect treat. I eat tem all the time on my diet. I bought my boyfriend an ice cream maker last year for his birthday. It's absolutely amazing the great ice cream and sorbet he can create! Not all of them are healthy, of course, but it's nice to know that only simple ingredients were included instead of a bunch of chemicals. I'm making it my goal to make some of the best recipes more healthy, including my favorites: strawberry sorbet and peppermint ice cream. Or try giving a frozen banana a whirl in a food processor, you can add a little cocoa powder or some PB2 - I couldn't believe how yummy that was/is! I live in Columbus, Ohio and here we have a magical place called Jeni's splended ice creams. Made with local REAL ingredients (including milk! Local milk! Good gravy!) and some amazing ice cream know how these are by far my favorite treat. I love Ben and Jerry's too, but it's easier to stay away when I know I can wait and have the most amazing ice cream experience in the whole world. when i lived in mexico ice cream was too expensive to have for our 5 person family. fresh fruits and veggies were a lot cheapper. i understand that may not be the same here in the states (or wherever you are) but this is what i want to share: my mom would blend banana + other fruits if we had them + milk and blend it a lot. then she would freeze it and call it ice cream. really, it wasn't exactly like ice cream but we had no other options. ice cream was too expensive at $3/gallon for us. so this was sweet, cooled you off in summer time, and was pretty creamy/fruity/sugary. maybe you want a creamy treat and not exactly ice cream. or you may want to alternate (like she did with cereal: buy lots of the cheap cereal and one box of frosted flakes and mix them so we still get a bit of frosted flakes while eating the cheap cereal). i know lots of this was done out of need and poverty but when i look at it with nutrition education i can tell it was VERY healthy and it did satify the sweet tooth. also, "hielitos de leche"! look it up! amazing treat, doubt it has nearly as many calories/fat/sugar as ice cream!